Umbria Part 2 With Hank and Ellen! OOOOOPS – the berry on the tree fell to the ground a wee bit early! I hit “publish” on Hank’s story before I realized the rest was flying about cyberspace reading out to me. Here is the rest of their adventure! The interrupted Hank continues: Castelluccio is world famous for its lentils. If you go, you must buy some. We had a nice meal on the terrace of the hotel, and called it a day. The next day we tried a nice restaurant called, “Granaro del Monte.” The food was good. When I ordered Linguini Chinghale, Linguini with wild boar sauce, I saw and tasted the difference between Tuscan and Umbrian fare. The pasta in Tuscany had a red wild-boar sauce, while the Umbrian version came in brown, meat gravy. Also, Umbria is famous for truffles, which are in almost everything!! Truffles are also harvested in Pontelandolfo! Ellen and I left Norcia with a resolve to re-visit it someday. The sun had finally become entrenched it the sky and the ride to Monteluco and St Francis’ Convent was gorgeous . 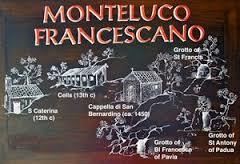 We can’t ever pass up Monteluco, where the Convent founded by St. Francis is located, and where he lived, prayed, and held Mass. The place is very primitive, but has a grove of trees that is where St. Francis went to meditate and pray. It is the most peaceful place I’ve ever been. We stayed here for a while just absorbing the peace that radiates out of every rock and tree. If you every go to Spoleto, make this a for-sure stop. We were headed to the wonderful Agriturismo Bartoli. It is located on the slopes of Monte Fionchi the mountains that overlook the Spoleto valley. (http://www.agriturismospoleto.net) The village is called Patrico, but it is hard to find on a map. It, too, is a twisty mountain road, much of which is gravel. This place is run by a family and has been a working farm for about 200 years and has been an agriturismo since 1988. Everything in Umbria seems to be uphill! We walked a lot and were thankful for our walking sticks! This is a place where you can do nothing or everything. Agriturismo Bartoli will take you horseback riding, truffle hunting, and will feed you until you burst. There is also lots of wine!! They drink it with every meal except breakfast. Ellen and I were told, however, that they only drink with meals. This place is a gem! If you want beautiful scenery, wonderful food, peace and quiet, horseback riding, or any of the above, this is a great place. Heading off to the Lazio region, but that’s a story for another day. Thanks again Hank! Love your additions to the “tree”. Next postLa Dolce Vita – The Tour!!!!!! Truffels in almost everything? Great wine with every meal? How wonderfully decedent. Sounds like a fine lifestyle.